Edit the details of your company. Logo: You can input your logo and see it in the box below if you already have one. The recommended size is 200px width and 100px height. Any format smaller is accepted. By clicking “remove logo” and saving, the current logo is deleted. Company type: Is your company a private limited company or a sole trader company? Address: The main address of your company included ZIP and city. Start of the first accounting year: The starting date of your accounting. End of accounting year: The date of the end of your accounting exercise. Base currency: The currency used as basis in your accounting. Rounding: Rounds all the bookings in your base currency. Currently there are two choice, to the nearest 0.01 or to the nearest 0.05. VAT: Here you can choose if you are under the effective rate or net tax rate. Usually it is the effective rate. 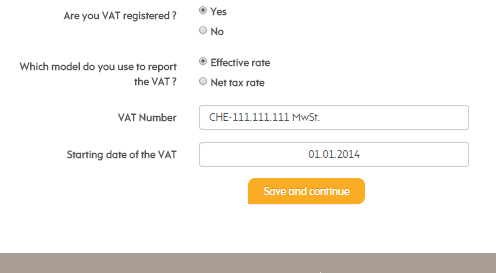 Furthermore you can edit the starting date of VAT bookings. “Save and continue” button: With this button, you save all the changes on the page.